If you are labeling clothing or items for your high school child, you are partially labeling their items because high school kids can occasionally have sticky fingers. When you are labeling items for your elderly loved one in a nursing home, though, this is less of a concern — meaning you have different considerations when ordering custom clothing labels. Since the memory is one of the first things to fail for many people, older loved ones tend to misplace their belongings or pick up items that they think belong to them, but don’t. Thus, you should clearly label their items in large print on a prominent area of the garment or belonging. Also, you need to label everything. This means putting stick on name labels on their pill boxes and their tooth brush, putting large sew-in labels on the back neck of their t-shirts or in the waistband of their pants and skirts, and even putting a bright stick-on label on their cane. 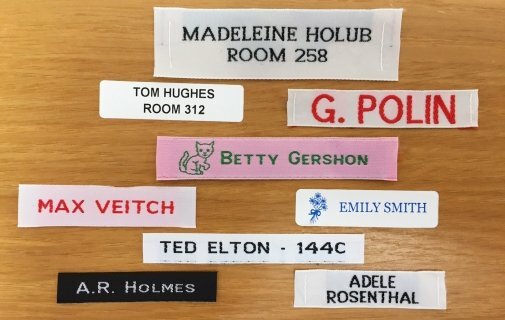 These labels won’t just help them find their belongings again, but will also help the nursing home staff figure out whose lost items belong to whom, which is a task that crops up quite frequently. Iron-on labels are perfect, since they don’t fall off and are difficult to remove, but many elderly people prefer sew-in labels, since they are often slightly softer. Whichever you choose, the labels from It’s Mine Labels are pre-cut to prevent the edges from fraying. We also take the time to print your label in large, bright, clear script, so that it will be easy to read as long as it is needed.